In a study of older mice, wolfberries (also called goji berries) appear to interact with the influenza vaccine to offer additional protection against the flu virus. The research, led by scientists at the Jean Mayer USDA Human Nutrition Research Center on Aging (USDA HNRCA) at Tufts University, suggests the wolfberry may increase the activity of dendritic cells, which play an important role in the ability of the immune system to defend against viral infections. The results were published online ahead of print today by the Journal of Nutrition. 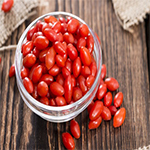 Older mice, with immune systems weakened by age, were placed on diets that included a small amount of a milk preparation of wolfberry fruit, also known as goji berries. Over a period of several weeks, they received two flu vaccines before being infected with the flu virus and monitored for signs of symptoms. The researchers then tested for specific influenza antibodies as well as the clinical symptoms of the disease such as weight loss among the mice. "We observed higher antibody response and better protection against flu as indicated by less weight loss in the older mice that consumed wolfberries," said senior author Simin Nikbin Meydani, D.V.M., Ph.D., director of the USDA HNRCA at Tufts University and director of the Nutritional Immunology Laboratory at the USDA HNRCA. "While previous studies have shown that wolfberries bolster immune response in mice, our results introduce their potential to reduce the age-related risk and severity of the flu virus in the presence of the vaccine." Meydani and colleagues isolated dendritic cells, which are known to activate infection-fighting T-cells. The cells were treated with a wolfberry concentrate and incubated for one week. During that time, the researchers observed that the maturity and inflammatory activity of the dendritic cells had increased, which suggests an improved immune response. "Although we have taken a step toward understanding the mechanism behind the wolfberry's interaction with the flu vaccine, it remains unclear which components of wolfberries may be responsible for the effects observed in this study," said co-corresponding author Dayoung Wu, M.D., Ph.D., a senior scientist in the Nutritional Immunology Laboratory and an associate professor at the Friedman School of Nutrition Science and Policy at Tufts University. "Wolfberries are rich in complex carbohydrates known as polysaccharides, as well as vitamins, carotenoids and flavonoids. Future studies in rodent models would be necessary to understand which components appear to be stimulating the dendritic cells." Further research is also needed to determine whether wolfberries could have a similar effect in older humans who receive the flu vaccine. "People's immune systems inevitably weaken with age, making them less responsive to the vaccine and more susceptible to the flu and its potentially serious complications," said Meydani, who is also a professor at the Friedman School of Nutrition Science and Policy and a member of the immunology program faculty at the Sackler School of Graduate Biomedical Sciences, both at Tufts University. "While flu vaccination is recommended for older people, the vaccine is only 40% effective in protecting older adults against flu infection, which is much lower than that afforded to younger people. For those reasons, it is important to investigate complimentary approaches that may enhance the effectiveness of vaccination." This research was funded under an agreement with the USDA Agricultural Research Service, contract #58-1950-0-014. The milk preparation of wolfberry fruit was provided by Nestec S.A. Although Drs. Meydani and Wu have received funding from Nestec S.A., it was not used to support this research. Additional authors of this study are Donald E. Smith, Ph.D., scientist and manager in the Comparative Biology Unit at the USDA HNRCA and Xiogang Du, Ph.D., a former postdoctoral associate; Junpeng Wang, D.V.M., Ph.D., a scientist; Xinli Niu, M.S., a former research assistant, all in the Nutritional Immunology Laboratory at the USDA HNRCA. The Gerald J. and Dorothy R. Friedman School of Nutrition Science and Policy at Tufts University is the only independent school of nutrition in the United States. The school's eight degree programs, which focus on questions relating to famine, hunger, poverty, and communications, are renowned for the application of scientific research to national and international policy. For three decades, the Jean Mayer USDA Human Nutrition Research Center on Aging at Tufts University has studied the relationship between good nutrition and good health in aging populations. Tufts research scientists work with federal agencies to establish the USDA Dietary Guidelines, the Dietary Reference Intakes, and other significant public policies.